Microwaves and other radio frequencies are known to affect the human body. But could they be responsible for voices in people's heads. In Chicago Illinois, a world authority on microwave hearing shows how it could work. Prof. Linn: “And sharing a micropulse… like a click… now it sounds like a chirp… with a tonal quality to it. Professor James Lynn is hearing sounds that aren't there. But he's not crazy. Pulses of microwave energy are being generated and fired at him from behind. The energy of the absorbed microwaves causes brain tissue to very slightly heat up and expand causing a pressure wave to be picked up by the hearing mechanism in the inner ear. Professor Lynn is far from hearing voices but it could be possible to send coded signals to an agent this way. Figure: At image above, the Professor receives microwaves from the back. At image below, two microwave signals are shown on the screen of the oscilloscope. The phenomenon of RADAR operators hearing electromagnetic radiation as clicks, buzz, hiss, or chirps was first discovered in 1947 and was reported in 1956 by the Airborne Instruments Laboratory in the periodical Proceedings of the IRE (renamed in 1962 to Proceedings of the IEEE). Airborne Instruments Laboratory (1956): An observation on the detection by the ear of microwave signals. Proc. IRE 1956. V. 44, No 10 (Oct). P. 2A. Alan H. Frey, a biologist working at General Electric’s Advanced Electronics Center at Cornell University studied this effect which was termed Microwave Auditory Effect or Frey Effect. He is said to have interviewed the radar operators that reported it. Here is the paper he published in 1962. J Appl Physiol. 1962 Jul;17:689-92. Human auditory system response to modulated electromagnetic energy. As mentioned at this site: "For the next two decades Frey, funded by the Office of Naval Research and the U.S. Army, was the most active researcher on the bioeffects of microwave radiation in the country. Frey caused rats to become docile by exposing them to radiation at an average power level of only 50 microwatts per square centimeter. He altered specific behaviors of rats at 8 microwatts per square centimeter. He altered the heart rate of live frogs at 3 microwatts per square centimeter. At only 0.6 microwatts per square centimeter, he caused isolated frogs’ hearts to stop beating by timing the microwave pulses at a precise point during the heart’s rhythm." Let us investigate the phenomenon with the initial conditions mentioned below. Phenomenon : 2450MHz in pulses that are 27µs apart and that are delivered at an intensity of 1250–40000 mW/cm2 give an auditory effect of a click or chirp to a person such as a radar operator. 2450MHz? That is the radiofrequency used by all microwave ovens in the world for heating. Just take these conditions to the lab, or even to the kitchen! What will you try it on? A bowl of water will suffice initially. Let us first understand how we use this radiofrequency in microwave ovens. After having understood the function of a microwave oven, let us consider the example of heating a bowl of water. What do you expect microwaves will do? Boiling. What boiling parameters could you measure? Temperature and pressure. You will need to measure the pressure wave that will be created. You would need a sensitive thermometer. And for pressure? Maybe convert pressure to electricity? That’s what a microphone does with the pressure of our voice on a membrane. Similar to a microphone you would use a hydrophone for liquids (ydor=water in Greek). Microwave hearing: evidence for thermoacoustic auditory stimulation by pulsed microwaves. Just for information a typical microwave oven uses a magnetron to produce about 1000W of radiated power at a frequency of 2450 MHz and power density of approximately 2.8 W/cm3. The scientists used, instead of water, a salt solution that resembles human fluids just as saline (NaCl) i.e. 0.15 KCl solution. What is the theory explaining this? It was mentioned on this site (http://www2.information-book.com/physics/radiowaves-microwaves/) that microwave radiation of a frequency of 2450Hz creates an electric field that changes direction 2.450.000.000 times per second. The water molecule has electric poles (dipole) and the radiation will rotate it. As the molecules rotate, they bump shoulders and friction occurs, meaning that their kinetic energy is dissipated as heat. Also, as they press upon neighbours they tend to push them away, and this results in expansion of the liquid. As a result a pressure wave is generated. When we say pressure wave we refer to a vibration wave or "sound wave" or "acoustic wave". This is the relationship that explains the typical result presented above showing positive and negative pressure transients with Pmax =20 dyne/cm2 or 2 Pa (Pascal). In other words, ups and downs (transients) with a max of 20 dyne/cm2 or 2 Pa (Pascal). How does this relate to biological materials? They had similar results from tissues such as blood, muscle, and brain; similar transients have been observed in vitro in tissue after irradiation by a Q-switched laser (8). Just for information, what is the threshold of human hearing? This is considered to be the 0 of the Decibel scale. It corresponds the pressure generated by a mosquito flying 3 meters away according to wikipedia. Atmospheric pressure (which reflects the weight of air on us) is 1 atmosphere or 100,000 Pa. The above would reflect a very small change of 2/10 billion of an atmosphere. In order to understand the microwave auditory effect we started by using a salt solution: we measured temperature with a thermometer and pressure with a hydrophone, a microphone for liquids. This allowed us to characterize the thermoelastic wave generated by the microwaves. Could we do the same measurement with a human or an animal subject? Hydrophone in the head? This experiment has been performed with an animal. In the human, models have been created. But first, let us focus on the “hearing” part and follow the scientific history. The fact that we hear something means that the auditory system is activated. Which parts are activated? We have a series of areas; all have neurons who are associated with electric activity. This means that you can insert electrodes to detect electric activation in different areas. Which ones would you choose? Let’s start from the end. Which is the brain region that processes auditory information? The auditory cortex (cortex means outer layer). One electrode for this. Helpful tip for brain function: there is a control room, termed thalamus (greek for chamber or room) which receives information for all senses except from olfaction. We will take a related region from the thalamus, termed “medial geniculate”. One electrode for this. Then we will take the auditory nerve (or cohlea nerve). One electrode for this. And here is the trick and theway of thinking of a smart guy: will you be searching before the auditory nerve? It is not that obvious, is it? What is connected to the auditory nerve (cochlea nerve)? The cohlea, a part of the inner ear. Cohlea is greek for snail. It is a snail-like chamber. It is made of bone, that is hydroxyapatite mainly. Sound is a vibration that propagates as a mechanical wave of pressure and displacement in a medium such as air, liquid or solids. 1. Vibration of air molecules reaches our ear drum/tympanic membrane. 2. Vibration is transmitted to 3 ossicles (hammer-anvil-stirrup). 3. Last one has a footplate which pushes onto liquid in a snail-like chamber termed cochlea. 4. Vibration via liquid lands onto the cochlea basilary membrane which unwound is like plane runway. 5. Attached to it are hair cells; vibration moves their hair and some internal parts push on channels which open and conduct ions/electricity. An electrical potential is generated. It must be noted that as the initial vibration reaches the hair cells, these vibrate more due to an active process; as as result they increase the initial basilary membrane vibration. In this way the hair cells actually amplify the vibration of the membrane. This is the first point where sound waves are transformed to electricity and this happens via vibration just like in the case of a microphone. Measurement of this response is termed “cochlear microphonics” abbreviated CM. 6. Electric signal is transmitted to auditory (cochlear nerve). We can also have conduction of sound waves via solids. 1. Vibration of bone structures i.e. skull structures. Note that all are connected to each other. Vibration is conducted to the cohlea which is connected to the skull. Continue to 4, 5 and 6 above. Let us reserve one electrode for the cochlea and “cochlear microphonics”. If we manage to detect something there we will search also in the middle and outer ear. Here are the scientists that performed the electrode measurements and their study. Brain Res. 1974 Jul 12;74(2):201-8. Analysis of central nervous system involvement in the microwave auditory effect. Let us play their role. We would use the electrodes during microwave exposure which results in microwave induced hearing. What about standard hearing? Air-borne hearing from the ear canal? Or maybe another mode of hearing like the one used in hearing aids i.e. bone-conduction hearing? 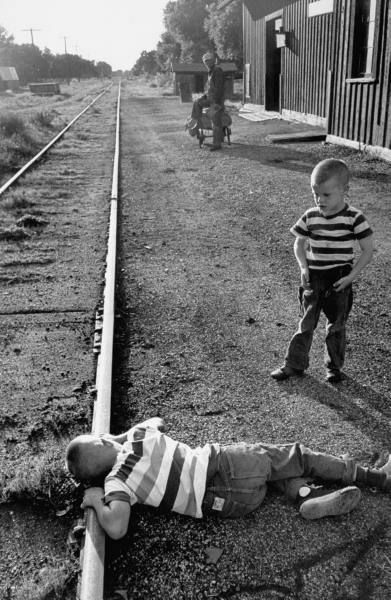 In western films, cowboys would put their ears on the train rails to hear if a train approaches so as to decide whether their herd should cross the rails. That is because sound is transmitted in solids much faster than air. In this case it would be 5km/s in the rail as opposed to 300m/s in air (according to Wikipedia). What happens if an individual has a hearing impairment due to a problem with the outer ear canal or the middle ear (e.g. hammer-anvil) but has an intact cohlea (inner ear)? It must be mentioned that the cohlea is connected to the skull. Therefore if you find a way to drop the sound waves in a certain way not in the ear opening but on the head surface near the ear, they will go inside the cohlea/inner ear. This is what is shown in the following picture of a hearing aid. The scientist of the cited study used a head vibration mechanism to deliver sound waves to the ear. In this way you compare microwave hearing and standard (sort of speak) hearing which is this case is pressure waves through solids. In practice how did they do that? Using a piezo-electric transducer placed on the head of the animal. This would deliver wave pulses of 1μs in duration with a repetition rate of 1 pulse/s. Measurements were done with nine cats. 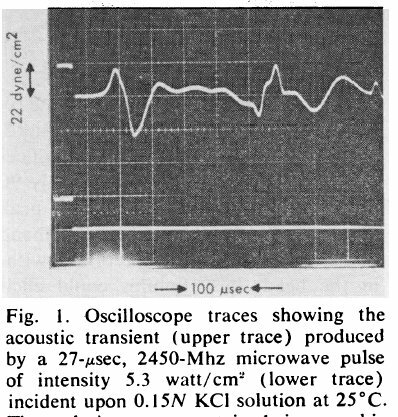 Microwave pulses of 2450KHz (standard microwave oven radiofrequency) were 32μs in duration with the same repetition rate of 1 pulse/s. Let us proceed to the detection of electricity using the electrodes. Let us try the auditory cortex. Here it is below as expected. If you hear something, the auditory cortex will be stimulated. (A) is the piezo-electric transducer vibration and (C) is microwaves. (B and D refers to something else and I have removed those). Is it getting transferred (relay) from the central control room, the thalamus? Let us try the related region. The answer is yes. Yes to both cases. What about the auditory (cochlear) nerve? Activated as shown. And now what about what is connected to the auditory (cochlea) nerve? What about the cochlea? No detection! But in both modes! How could this be? Hearing aids work just like the vibration machine and would stimulate the cochlea. There must be something wrong with the technique. Just think what could prove that the cochlea is involved. The opposite reasoning: the inactivation of the cochlea. Is there a way you could inactivate it? What is it exactly? It is a setting with fluid where waves are transferred as in the air. Could this fluid be drained? Yes it can; it can be aspirated. So just repeat the detection with the electrodes after cochlear aspiration. Bingo! No electricity detection, which means no hearing signal in microwave or vibration. We therefore have our answer. Microwaves activate an ear piece, the cochlea. Previously, in Part I, we inferred that the reason that we hear microwaves is that the cochlea is reached by the thermoelastic wave, the boiling wave that the microwave radiofrequency induces. We came to this conclusion as cochlea deactivation inhibits the auditory response. However, we did not actually see the electrical activation of the cochlea. Here is a study that demonstrates it using experimental animals. They used microwaves of 918-MHz in pulses of 10μs and a sensor in the cochlea. First they tested guinea pigs. One peak of 50μV of electricity (electric potential) every 20μs. One every 20μs, what does that gives us? 50000 peaks per second or a frequency of 50000Hz or 50KHz. It must be noted that the cochlear microphonic is the direct conversion of sound to electricity. Therefore, 50KHz is actually a sound frequency. It is at the top limit of the auditory range of guinea pigs. Humans hear up to 20KHz approximatively. The frequency found was lower. Is there any association between the two cases? After analyzing the data, an interesting result emerges. The frequency depends on the longest dimension of the brain cavity, so actually on head size. It is of note that a prediction can be made for microwave induced sound for humans. It is around 7 and 10 KHz. Interestingly, radar studies performed before had showed that people that had a hearing problem that wouldn’t allow them to hear sound above 5Hz could not hear microwave induced sound!